Don’t call me Big Nose! 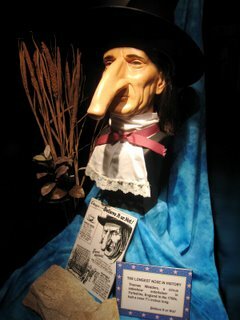 A life-size model of an 18th century Yorkshireman with the longest nose in history is among the attractions at London’s newest tourist attraction. Thomas Wedders’ nose was 19cm – or seven and a half inches – long, earning him a place in Ripley’s Believe It Or Not museum in Piccadilly Circus. Edward Meyer, in charge of collections for the global chain of ‘odditoriums’, said: “We try to display art that you can’t see anywhere else. Seems like they’ve succeeded in that alright. An image on wall in Chiquinquira, Colombia, appears to resemble that of Jesus Christ on April 23, 2006.